Davie Stephens is involved with every aspect of his farming operation, including how data is collected, stored, and shared. 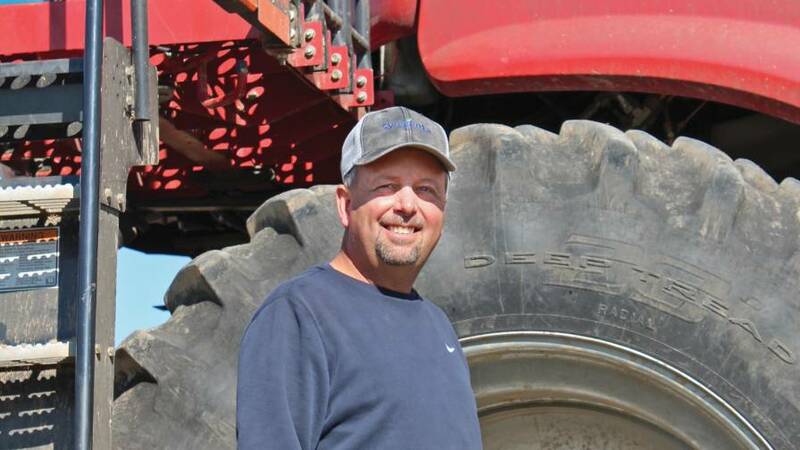 Davie Stephens, who lives in Hickman County, KY, farms more than 5,000 acres in Western Kentucky and Northwestern Tennessee. Stephens Farms produces soybeans, corn, and poultry. In addition to having held several state-level soybean association positions, Stephens currently serves as Secretary of the American Soybean Association (ASA) and has been an ASA director since 2012. Stephens is involved with every aspect of his farming operation, including how data is collected, stored, and shared. Here he discusses some of his views on data within his operation. Describe your history with precision technology and farm data. In the mid-1990s, some of our first use of farm data was GPS field grid sampling for soil samples. After harvest, we determined our strategy for fall and spring fertilizer application. We applied fertilizer using variable-rate technology as opposed to a uniform rate across the field. Over the years, this has helped our bottom line and contributed to our farm’s environmental sustainability. At the end of the 1990s, we were installing yield monitors in the combines, which produced field maps and harvest results. While we were intrigued with the notebooks full of colorful maps, these maps and harvest results only confirmed what we already knew about our farms such as which fields were the most productive. But then we started focusing on how we could use that data to get a return-on-our-investment in technology. Fast forward to today, we integrate the data from the soil sample, the nutrient maps, and satellite imagery to create our variable-rate prescriptions for dry fertilizer, anhydrous ammonia, and seeding. We have continued to partner with reputable vendors such as DuPont Pioneer and Monsanto with their Encirca and Climate programs to pinpoint what works best for our farm. One challenge with precision technology is when manufacturers stop supporting equipment. Adding and upgrading technology costs money, and this is a new expense category that farmers must continue to budget. Who are your partners as far as precision and data? We predominately run a Case IH fleet and get dealer support for the machinery; however, for precision and data we use AgLeader for application and Precision 20/20 monitors for planting. I hire a private consulting firm to collect and review the data. This consultant, along with his agronomists, comes up with recommendations for application and planting. Together we review these recommendations and create our final plan. What led you to use a consultant? My farms are located in several counties so I have used multiple vendors across our area. About six years ago, one vendor who had performed the soil sampling could not get to the field in a timely manner for the application of fertilizer. I called another vendor in the area, and they said they could apply the fertilizer if I sent them the prescription created as result of the soil sampling. When I asked the first vendor to provide the prescription — one which I had reviewed and approved — they refused. Even though I had paid them to perform my soil sampling, they insisted they owned the data. After much discussion and the realization that withholding my data would impact our future business relationship, the vendor finally released my data to me. That is when I realized suppliers were using data for a competitive edge, and I started getting actively involved in data ownership issues. Now with an independent consultant I have the freedom to use different vendors, yet I own my data. Sure, it costs a little more, but it does give me the confidence knowing my data is independently held, and I have full ownership over my data and who can use it. What do you see as untapped opportunities for precision and data in farming? Twenty years ago, I would never have imagined all the data that would be at my fingertips, whether I am in the tractor or at my home office. Technology improvements in biotechnology, such as Bt corn, gave producers clear return on our investments, as did variable-rate technology with the later addition of swath control. With the expected continuation of low commodity prices, innovative data leaders must similarly show producers how precision and data can contribute substantial return on our technology investment. I am excited to see where we will be with data, and its impact on my farm’s bottom line, in the next 20 years. Not surprised. I would also suggest farmers check their agreements with OEM companies regarding the ownership of data stream that comes from their machines. Each manufacturer may have different assumptions regarding data ownership.